In an earlier entry I discussed the unhelpful ‘defence’ of niqaab that only a few thousand women wear the garment. However, a side argument is that only a few hundred wear the burqa, the garment best known from Afghanistan which covers the whole body including the eyes and face. I saw Miqdaad Versi of the Muslim Council of Britain make this argument on Twitter this morning. I find this a very dubious claim. I would imagine that the number wearing the Afghan burqa in the UK is closer to zero, if not actually zero. 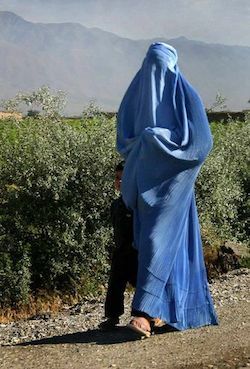 The burqa is a garment specific to rural Pashtuns in Afghanistan and Pakistan; only a minority of British Asian Muslims are Pashtun. The garment is not widely available here, it is not the Sunnah, and it is not practical. The niqaab is widely available both in shops and online and is practical in the sense that it can easily be flipped up when the wearer needs to show her face (there is also a layer that can cover the eyes which can also be flipped up or down; if you see a woman with her whole face covered, this is probably also a niqaab). There is another garment called the burqa; this is worn in the United Arab Emirates and covers parts of the face. It consists of a cloth veil stretched over a metal frame. There are parts of London where there are lots of Muslims from wealthy parts of the Gulf and I’ve walked around those places very frequently; I’ve never seen an Emirati burqa either. Also, the Evening Standard website yesterday published a piece about a study which claimed that British Asians received worse treatment after terrorist attacks: some 40% of British Asian Muslims said they experienced a “rise in negative treatment” and 26% of Sikhs, and just under a third said people had been abusive to them while 11% said they had been excluded from events. The picture they use to illustrate the report is of a woman in niqaab, and stock images of women in black niqaabs have been used to illustrate reports of ‘trouble’ involving Muslims for years (whether it’s terrorism, the spread of “radical ideologies” or whatever discontent of any kind). This insistence on linking niqaab to extremism of any sort is part of what generates hatred towards Muslim women in particular and the number of women wearing it declined after media campaigns targeted at it, not immediately after major terrorist attacks. The impact on Sikhs has been widely observed both here and in the United States; Muslims in some parts of the world wear turbans and pictures of well-known terrorists wearing them have appeared in the media often. I have come across Muslims who wear a certain type of turban, but the majority of people who wear them in western countries (albeit a different style without a cap underneath) are Sikhs and there have been many violent attacks on Sikhs by people who mistook them for Muslims. Who cancelled the Alton Muslim fun day? Next story Why did I just lose 25 followers?